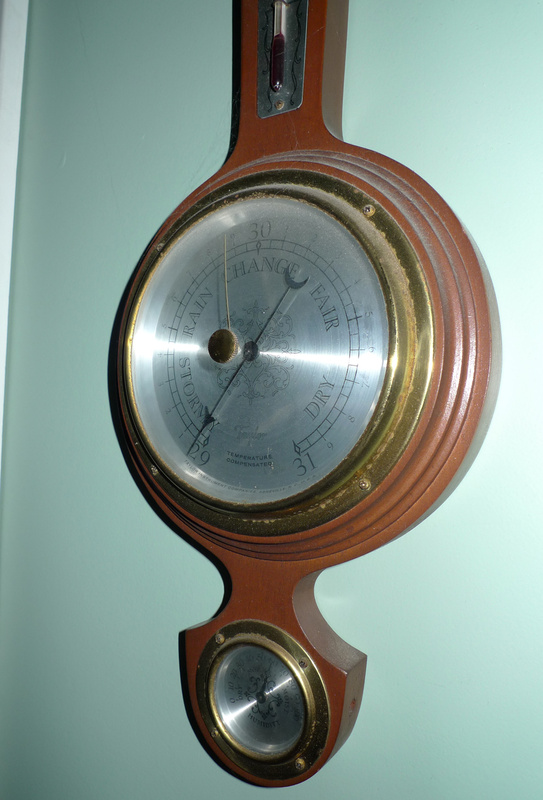 We've never seen the barometer go this low! We were extremely lucky when it came to the hurricane that past. Saturday night was frightening. 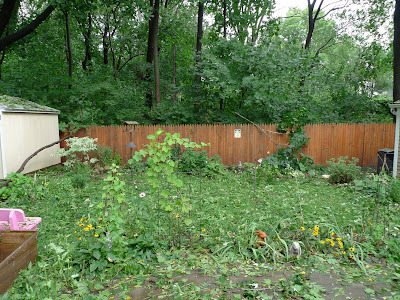 We really should have not slept in our bedroom (which is the closest room to the tall maple and black walnut trees). 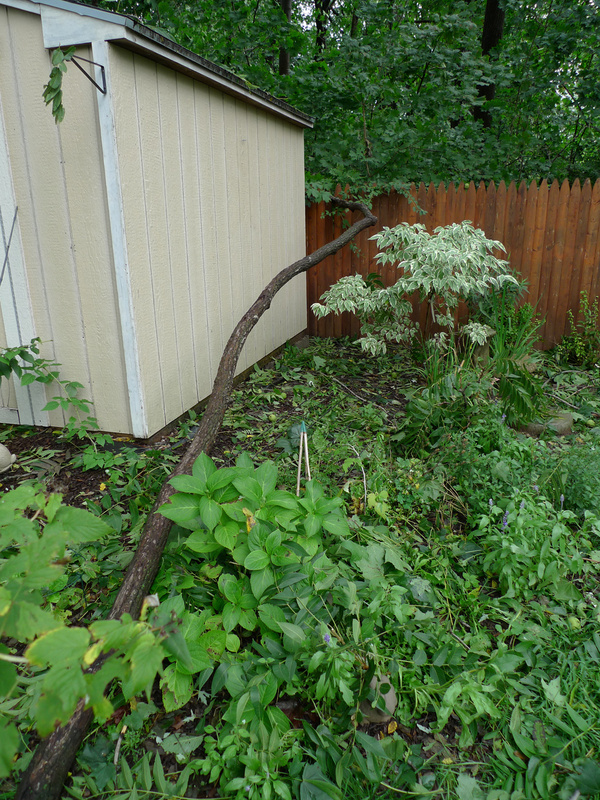 There were severe thunderstorms overnight and the wind was whipping the trees around. I woke up several times wondering if I should wake up Rob and move us to the living room couches. I kept praying that our house would stay safe. 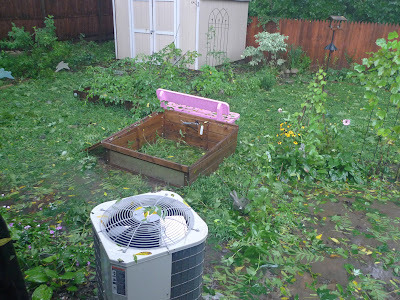 Flooding begins in the back yard ~ 8:41 a.m..
On Sunday morning we lost power. Water from the rain began to pool up out back. 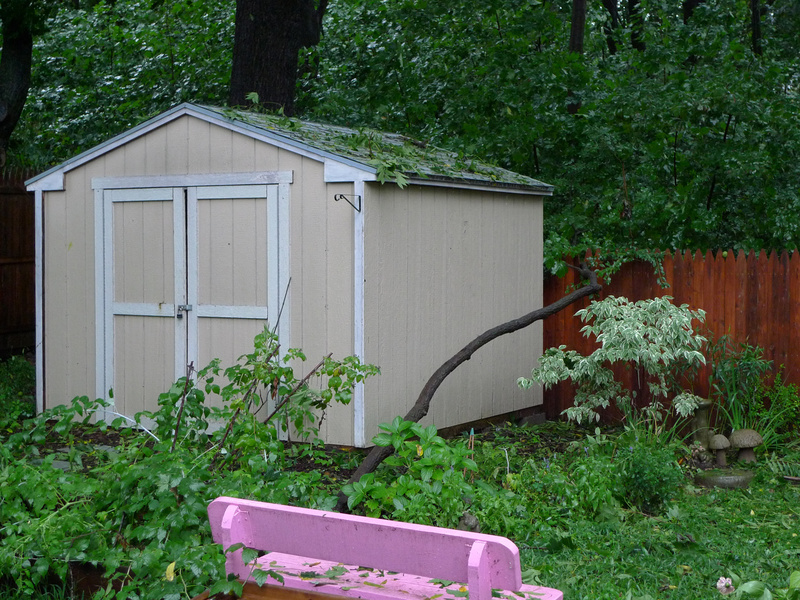 We listened to our police scanner and heard multiple reports of trees coming down in our town. And then we heard the thud. I raced to the back window, and was happy to see that a large, 12 foot tree limb (probably from the black walnut) fell from above and just missed our shed. for trumpet vine ~ 10:39 a.m.
Power was restored Sunday night, but then we lost it again Monday afternoon. Overnight on Monday it returned, and has stayed on since. There are still several people in our state without power. We're thankful that we did not have any property damage from this storm. The Connecticut River, down the road from us, is cresting, and yesterday was already six feet above flood stage. But still, our state was lucky. Two hours to the north of us, in Bennington, Vt. (where we like to vacation), the town is still experiencing terrible flooding, road washouts, bridge washouts, and more. No matter how well they can predict a storm, Hurricane Irene was still unpredictable in the end. After the storm passed ~ late Sunday afternoon. Better view of the branch that fell.